Located in Harleston, South Norfolk / North Suffolk. Close to Diss, Bungay, Halesworth, Long Stratton, Norwich and Surrounding Areas. Do you want to learn Spanish? Or maybe you want to continue to learn to speak Spanish at a higher level? Perhaps you need Spanish evening classes or Spanish tutorial for business or are moving abroad? Well, if you live in South Norfolk or North Suffolk and are researching languages courses, then I hope I can help. Whatever your reasons for wanting to speak Spanish (and it will hopefully become a lifelong passion) I may be the Spanish language teacher for you. First of all, let me tell you a bit about my background and how I came to teach classes in this vibrant language. My name is Heather and I have been passionate about Spain and Spanish since my first visit to the Iberian Peninsula over thirty years ago. I studied Spanish and Literature at the University of London (QMW) and University of Córdoba, Spain where I was later to spend several years teaching and translating. My family and I have also lived in Catalonia in North Eastern Spain where I taught Cervantes Institute Spanish courses alongside English as a Foreign Language. Although based in South Norfolk (very close to the Suffolk border), my family and I have a deep connection to Spain and try to return as often as possible. My daughter is fluent in Catalan and Spanish. My husband has worked hard to learn Spanish and now speaks well. I took the Further and Adult Teacher Training (Certificate in Education) in 1997 and qualified in EFL in 1999, having worked in Further Education and private language schools in Sussex, Norfolk and Spain including: City College, Norwich, City College Brighton and Hove, the WEA, The Little School of Altafulla, Nord Anglia International and Brighton Language Centre. I have lectured in FE (AQA Board GCSE English, Functional Skills English and ESOL), delivered Open College Network Spanish conversational courses, A level, OU and GCSE Spanish courses and Cambridge English exam courses. 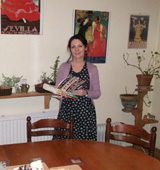 I have also translated for the Tourist Board in Córdoba, Wren Media in Suffolk and various local businesses. Norfolk Spanish was successfully established in 2005 with great support in the local community and students from a 15-mile radius, all of whom could not find suitable languages courses in their catchment area. Two students have gone on to study Spanish at degree level, many have passed GCSE, A level or OU modules and many more have prepared for life abroad, business ventures or holidays, enjoying social occasions such as our Spanish parties in King George´s Hall and making progress with lifelong language skills. We have a monthly Spanish newsletter with student contributions and thrive on our shared passion for all things Spanish! Please read my testimonials page to see why my students decided to learn to speak Spanish with me - in their own words! "Heather's passion for the Spanish language and culture definitely rubbed off on me and I went on to work in Spain and study Spanish as a degree." "I studied Spanish with Heather for about a year and in the space of about four months she helped me obtain a GCSE in Spanish on top of my other A Levels. I would definitely not be in the position I am now without her help throughout!" "Heather managed to introduce me to the dreaded complexities of grammar and tenses. I found that after a few weeks she had given me essential confidence in this near-universal language. The best and most approachable language teacher I have met."